Dr. Romig grew up in Columbia, SC. After earning her BS in animal science at Clemson University, she attended the University of Georgia for veterinary school. She stayed at UGA for an additional year as an ambulatory intern in large animal medicine, surgery and theriogenology; she then filled in as the interim intern in the zoological medicine service. Dr. Romig moved to Greenville, SC in 2010 with her husband, Bryan. 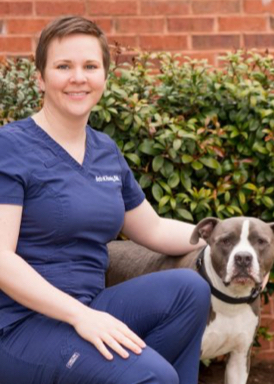 After spending four years in general small animal practice and working at the Greenville Zoo, she moved to San Diego, CA to pursue a residency in veterinary dentistry and oral surgery. She moved back to Greenville in 2016 and is working toward board certification in small animal and equine dentistry. Her special interests include dentistry in zoo and exotic species. Dr. Romig and her husband are glad to be back near the Blue Ridge Mountains where they can spend time enjoying the outdoors with their dog, Blue.